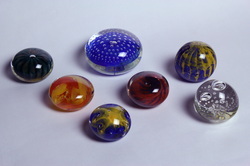 In this workshop you will first learn how to make a variety of paperweights and then you will learn how to blow a bubble with glass and transform it into a tumpler or vase. Each participant will successfully make a number of paperweights, tumblers, and vases. This is a one day workshop. We aim to have 4 participants so we can give you a personal learning experience. Refreshments and a light lunch are supplied on the days. To get the dates or book a place on the next workshop please Contact us. We are happy to discuss your particular requirements if our existing offerings do not meet your needs.